The ISA Volleyball, Soccer and Cross Country teams recently competed in the NECIS tournament. NECIS is the Northwest European Council of International Schools, an organisation which provides a safe environment for athletes from international schools to compete against each other to their very best of their ability. The tournament encourages qualities such as good sportsmanship, respect and full participation in students and is an important part of any athletes calendar. 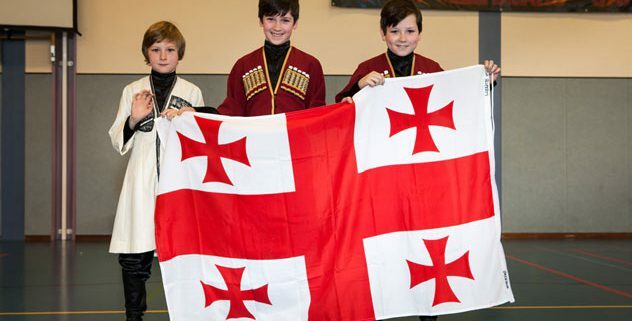 This season, ISA hosted the NECIS Varsity and Junior Varsity tournaments, the Under-12’s tournament was held in Copenhagen and the Under-14’s tournament in Luxembourg. The following weekend, 59 athletes from ISA travelled to Luxembourg to compete in the Cross Country tournament. The full breakdown of the results of each tournament is below. Congratulations to each ISA athlete who took part in the tournament! On 31 October, 2017, ISA’s Amnesty International Club engaged in their annual tradition of hosting an event called the Amnes-Tea, “ a campaign that is able to raise awareness about humanitarian issues across the whole world, making everyone an active member of society in order to create positive change”, according to Isabelle Buklarewicz, chair of the ISA’s Amnesty club. Students, teachers, and parents are encouraged to sign petitions to help those whose human rights have been violated, and free tea and cookies are given out as incentive. All it takes to help make a change is a signature, for as these signatures from all over the world pile up in a single office, governments are made aware of the fact that their actions are under international scrutiny and are pressured to take action to free those whose rights have been abused. 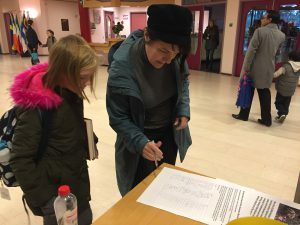 This year, the club collected signatures for two causes, one of which was the Saudi Arabian blogger Raif Badawi, who was unfairly detained in June of 2012 who, according to Saudi Arabian forces, insulted the Islamic religion. He was then sentenced to 10 years in prison as well as 1000 lashes in January of 2015. 50 of these lashes were inflicted in a public square. It is the opinion of medical professionals that he will not survive the rest of the lashes. His case has been taken up by several organizations, including Amnesty International, who are fighting to have him freed. The second was the catastrophic issue of the ethnic cleansing that is currently happening in Myanmar. As of October 16, 537,000 Rohingya refugees have come to Bangladesh after escaping from the brutal environment of Myanmar’s Rakhine State. Those who have not fled their home suffer as the nation’s forces inhibit their access to aid provided by organizations. Commander in-Chief of the Myanmar army, Min Aung Hlaing has the ability to cease the violence that is happening in Myanmar. Gathering signatures will illustrate the scale of demand there is for the violence to stop. Over 150 signatures were collected. Molly Christophers, a member of the club and a participant in the event says, “It was really great to see the ISA community come together to support this important cause.” The Amnesty International club has raised immense awareness about human rights within its community, and it hopes to further make a change that resonates on an even larger scale. https://www.isa.nl/wp-content/uploads/2017/11/Grade-7-Petition-Signer.jpg 1920 1080 Erika Harriford https://www.isa.nl/wp-content/uploads/2015/08/ISA-logo.png Erika Harriford2017-10-31 11:41:062017-11-15 11:54:10ISA Amnesty International Club Hosts "AmnesTea" Petition Drive. SHARE, ISA’s parent fundraising group, continued to provide strong support to student charity clubs through it’s Spring fundraising efforts. From a donations-based Designer Pop Up shop, hosted in collaboration with the ISA Macmillan Cancer Student Group, to it’s Easter Bake Sale, Take Home Dinners evening and the school’s annual community fun run, Run to SHARE, the group had a calendar packed with opportunities for the ISA community to join together and support a wide range of causes and student initiatives. The pop up shop raised over €2.200, the Easter Bake Sale raised €1.300 and the seven ISA communities which contributed to the Take Home Dinners, helped to raise €1.700. Over the past week the ISA community has been busy showing their Halloween spirit! On October 27 SHARE held a bake sale in the Main Foyer after school. Many parents took the time to create delicious and festively decorated treats. In the end, SHARE raised an impressive 1420 euro. You can find more information and pictures here. 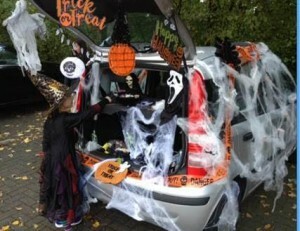 The American PTA Community helped organise Trunk-or-Treating in the ISA parking lot on October 28. ISA families decorated their cars (or bakfiets) and passed out candy to all those dressed in their costumes. Over the past month, students in the PYP programme have taken numerous field trips to connect with themes from their classrooms. As part of their Different People, Different Lives Unit of Inquiry, Grade 5 students recently visited the, ‘In Het Donker Gezien?’ museum. Students were able to briefly experience what it is like to be visually impaired and reflect on how these individuals experience the world. Connecting to their Units of Inquiry, Who We Are and How the World Works, Grade 4 recently took a bike trip to the Amsterdamse Bos. The bike trip helped build community amongst the students, but students also learned more about how the Bos was built and its impact on the local community. Grade 2 also took a trip to Amsterdamse Bos to support their current Unit of Inquiry, Our Fragile Earth. Students did field research on the local habitat and gathered evidence on the different plants and animals that live in the forest. One of the biggest benefits of ISA is that students are able to interact and learn from our amazing Amsterdam community! It’s that time of year when Upper School seniors are busy applying and prepping for their next exciting journey after ISA. Upper School counsellors and teachers are working hard to help navigate students through these sometimes confusing paths. ISA, in cooperation with the Fulbright Center and the U.S. Consulate General, welcomed over 30 American colleges and universities during the 5th annual Ivy Circle USA University Fair on 29 September. This fair offered a unique opportunity for students to meet with representatives from U.S. universities/colleges. We look forward to seeing the next steps for our Class of 2017! Recent Lower School assemblies have focussed on the PYP attitude of “appreciation”. Students enjoyed listening to Louis Armstrong’s “What a Wonderful World” and learned how appreciative so many different groups of people are for the support in the recent World Water Day campaign. The Lower School Student Council helped organise the campaign and counted all the coins donated through the small water bottles. An amazing €4,222.60 was raised in just one week! We are so appreciative and we are sure that both East Africa Care and the communities that we help will be too! Thank you to everyone who took part. Thank you to every class who took part in the challenge. During the month of November, Denise Granai, one of the Lower School Counselor’s, offered two hour ‘Parenting with Positive Discipline’ workshops. These two hour workshops provided an overview of Positive Discipline through experiential activities. To learn more about the importance of Positive Discipline read our recent article in ISA Connections magazine.